Recently I’ve been looking at a small lightweight hatchet to buy for my INCH bag and came across this little gem. It’s a 14 inch hatchet, weighing 1.86 pounds (0.84 Kg) made of decent 1055 steel and looks like it would do cut small branches pretty decently. Fig1. – The unmodified axe. 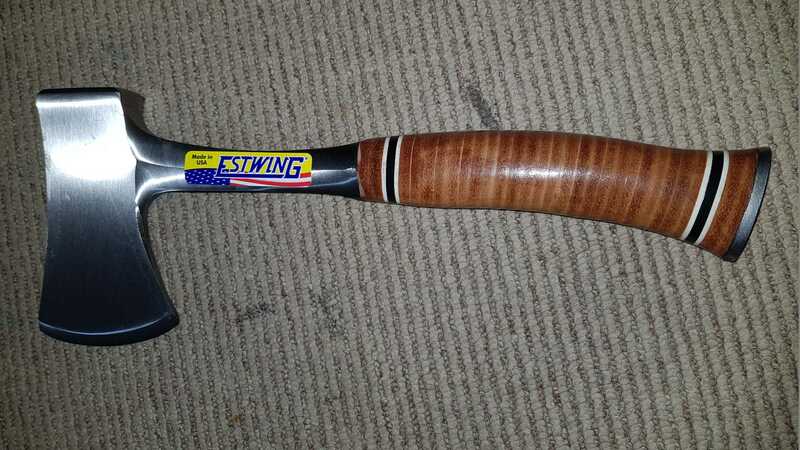 I picked one up knowing the only real flaw was the coating on the handle with the intent to follow the guidelines of the user below, who recommended stripping the coating and applying your own. It requires a bottle of neatsfoot oil and a couple of sheets of sandpaper to get the desired result of a weatherproof, better feeling handle which will cope well in damp conditions. Fig2. 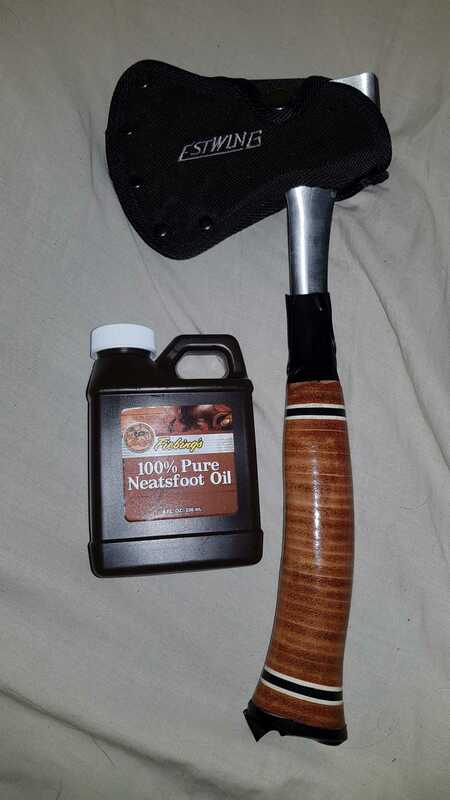 – Fiebing’s Neatsfoot Oil and the Axe. I don’t write many reviews but this little gem deserves one. Proudly made in the USA since 1923, this is the same fine tool your granddad bought, with the same high quality forging and rugged leather grip. Properly used and cared for it will stand up to several lifetimes of hard use. I recently bought a spare from Amazon and this review is based on that item. 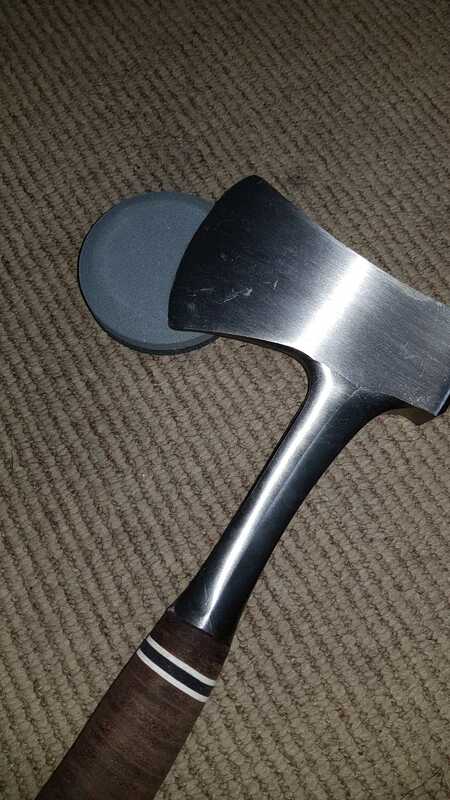 A couple of observations/recommendations: I note one reviewer whose hatchet handle rotted. Well yeah. As these come from the factory the handle is given a glossy varnished finish and the stacked leather grip underneath is very dry. It looks nice when it’s new but the varnish will crack and chip with use, and then the grip will absorb water like a sponge, ruining the leather. Thus, knowledgable sportsmen have long looked fondly on that glossy factory finish and then taken a couple of sheets of 100-grit sandpaper and sanded it off. Mask off the metal part of the shaft of the handle, no point in scratching that up, but do round off the sharp edge of the metal washer at the base of the handle to make it more comfortable in use. Be sure to get all the varnish off, the leather underneath will look almost white when you’re done sanding. 100 grit is fine, there’s no need to finish with finer grades. Then get a bottle of Fiebing’s Neatsfoot Oil (available at Amazon!) and rub it in. If you didn’t get all the varnish off you’ll immediately notice light spots where the oil isn’t soaking in, stop and sand those off. You’ll be amazed at how much oil that leather grip will absorb, my new one has taken at least an ounce of oil and it’s still sucking it up. 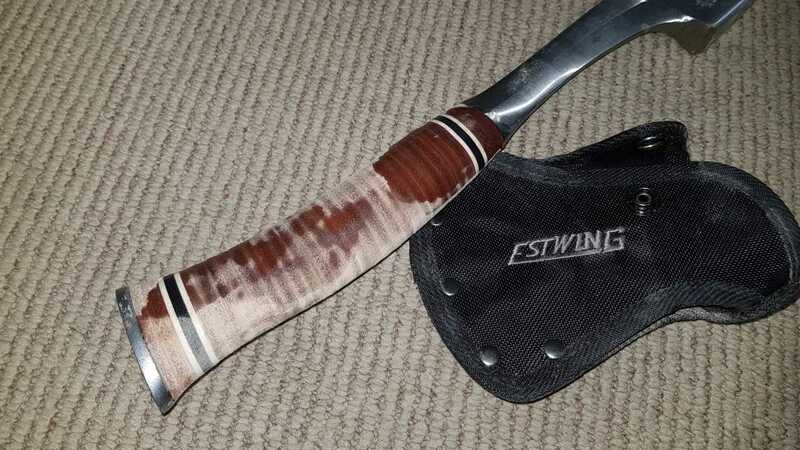 It will take several applications over several days to do a thorough job — the idea is to completely saturate the leather grip — just slather it on with a fingertip at first and then rub it in after a couple of days’ applications. Put some on the sturdy leather sheath they provide while you’re at it. The neatsfoot will give the grip a nice antique brown finish and a slightly sticky, non-slip feel, and once the grip is thoroughly saturated it will be nearly impervious to the elements *forever*. I have hunting knives and another old Estwing hatchet that were given this treatment by my dad and grandfather before I was born — that was a long time ago — the grips have turned black over the years but they’re still as sound as the day they were made and they’ve seen a lot of weather over the years. Then get a Lansky “puck” dual grit sharpener (also available at Amazon!) and sharpen the blade. They come dull, probably for product liability reasons it will only be as sharp as you’re capable of making it, but it will take a fine edge with a little effort. Then avoid chopping it into the ground, rocks, or what have you — it will take you several patient hours to put the initial edge on the blade and all that effort will be wasted if you whack it against a rock. The blade should never touch anything but the wood it’s made to cut. Learn to split kindling safely by taking a 1-2′ piece of wood 2-3″ in diameter, holding it by one end pointed away from you and resting the other end parallel to the ground across a larger piece of wood. Split the far end by chopping through it sideways into the chopping block and then giving the hatchet and the wood a deft twist to split it lengthwise (a glove on your off-hand isn’t a bad idea). Repeat with each half until you have enough kindling. Whatever you do, don’t try to hold a piece of kindling on end and split it lengthwise lumberjack-style, that’s a good way to lose a finger or chop yourself in the knee. Guys, this is a tool every manly man should treat himself to and learn to use! There’s darn few things in this world that are the same high quality they were 90 years ago but this is one of them. Fig3. 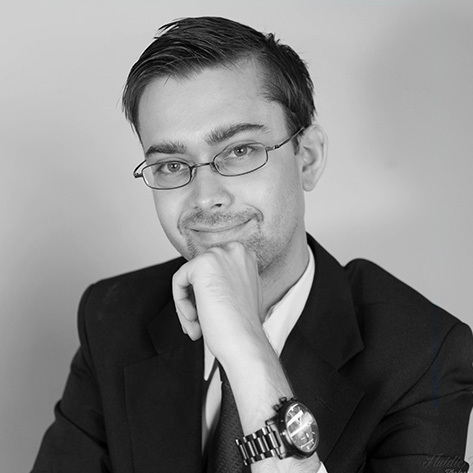 – The stripped coating. 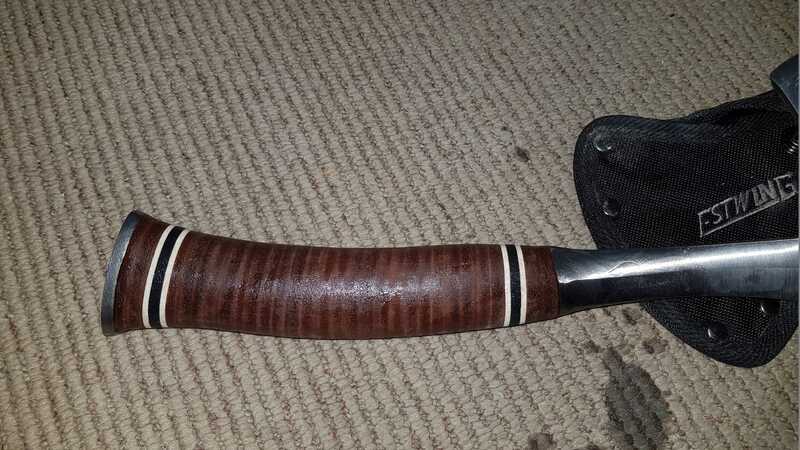 Following his comments to the letter I went ahead and stripped the handle of the current coating with sandpaper which took a few days with about 30 minutes per day. I was sure to cover the metal with tape to prevent scratching it up. Fig4. – Applying the oil. When the handle was clear of coating I then used my fingers to apply and rub oil into the handle for about 20-25 coats, applying 3 or so per day. The oil was readily absorbed and looks great on the handle, giving it a deep, rich appeal. The following day I applied three more coats and left it to dry again. Fig5. – The last coat applied but still wet. After the last coat was applied and left to dry it has a lovely leather feel to it compared to the tough plastic feel previously. Fig6. 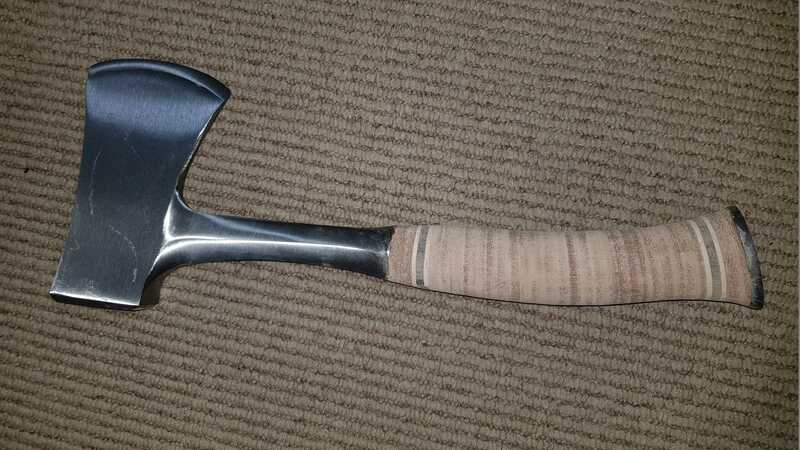 – The completed axe with the coatings.